Based on 100 years Calendar (Hnit-Ta1-Ya2 Pyet-ga1-dain2) published in Myanmar. Each Burmese Calendar Months la1 (which means "Moon") are broken into before or after the Full Mon Day starting from New Moon Day. New Moon Day (waxing of the moon) is the first night the moon appears as a crescent in the night sky after the moonless night. Each Calendar month starts with the New Moon Day, or la1-hsun3 in Burmese. la1-hsun3 days are counted from 1 up to 13 or 14 depending on the month having 29 days or 30 days until the Full Moon Day. For example, la1-hsun3 chout yet nay1 refers to sixth (chout) day after the New Moon Day where nay1 means "Day" and yet is the measure word for the number of days. Full Moon Day is known as la1-pyay1 nay1 where pyay1 refers to "be full" or "to be filled up completely". Devout Buddhists in Myanmar observe Sabbath Day (u1-boat-nay1) which falls on Full Moon Days, The days of Moonless Nights, and every 8th day after the Full Moon Days and Moonless Nights. That means there are four u1-boat-nay1 in a month, or roughly one every week. During u1-boat nay1, people meditate, say prayers, send loving-kindness in all directions to all beings, listen to Dhamma talks by the monks, and practice 5 precepts, namely (1) Not taking life (2) Not taking what is not given (3) Follow Right Speech (4) Refrain from sexual misconduct, and (5) Refrain from consumption of alcohol. Some Buddhists also fast for at least half a day (after Noon time), or take vegetarian food thet-thut-loot sa3 ja1 deare2 during u1-boat nay1. The word thet-thut-loot is made up of the words life + kill + empty. It means free from killing. For minority ethnic groups such as Kayin, Kachin, Chin as well as some Burmese, December is the time to celebrate Christmas. Christmas Day is an official holiday in Myanmar. Yes, in Myanmar there are Christmas celebrations. myan2-ma2 pyi2 hma2 kha1-rit-sa1-mut loat ja1 tha1 la3 -- Do people celebrate Christmas in Myanmar? Loat ja1 ta2 pau1 -- Of course we/they do! How to say "to celebrate" in Burmese? myan2-ma2-pyi2 hma2 kha1-rit sa1-mut kjin3-pa1 ja1 ba2 tha1 la3 -- Do people celebrate Christmas in Myanmar? Myanmar Calendar is based on Lunar system which has alternating months with 29 days and 30 days, and a total of 12 months in a (normal) year. Simple calculation shows that it all adds up to only 354 days in a year, which is much less than approximately 365 days for the earth to go around the sun. Since the weather and regular seasons on earth more or less follow the solar calendar rather than the lunar months, that must have been a problem for farmers who must grow crops at the regular intervals such as at the start of monsoon season around mind-June every year. In order to make up for loss days in a year, Burmese Calendar adds an extra month every 3 years known as wa2 htut deare2. Basically, du1-ta1-ya1 wa2-hso2 (Second wa2-hso2 month) always falls around July every 3 years or so. In the long run, even that is not sufficient to make up for the loss days, so the interval of adding an extra month is sometimes reduced to 2 years known as wa2 ji3 htut deare2. According to some elders, wa2 ji3 htut deare2 occurs roughly every 10 years interval in addition to wa2 htut deare2 at every 3 year interval. Well, not exactly right. I know it has something to do with the frequency within the 19 years interval, but I have not verified the calculations. You can read more about it here. I have included in the left column of this page the historic pattern of Myanmar Calendar adding an extra month for the last 100 years. If you take a look at the Calendar in Myanmar with both International Dates and Burmese Months, another curious thing you will find is that the days 1,2,3,4 in Burmese only go up to 14. Please refer to u1-boat-nay1 explained in the column on the left side of this page. The year AD 2012 is the year 1374 in Myanmar Calendar. Since traditional Burmese festivals follow the lunar calendar, most except for the Water Festival and Burmese New Year, fall on different Gregorian dates every year. The following table shows Myanmar public holidays (Dates shown in red), festivals, and celebrations for the year 2019. On the other hand, some public holidays such as Independence Day, Martyrs' Day, and Christmas follow the Gregorian Calendar, and fall on the same date every year. There are some important changes in Myanmar public holidays starting 2018. The most noticeable change will be Myanmar Water Festival and New Year which is reduced from 10 days to 5. The lost holidays are made up by 2 extra days of Thadingyut in October, Tazaungdaing eve in November plus International New Year's eve and New Year's Day. Structures and poles in Manaw Festival have some resemblance to Totem Poles of First Nation People in Vancouver, Canada. Getting popular in Myanmar and increasingly commercialized. This Pagoda at 114 metres (374 ft) in height is tallest in Myanmar, and taller than Shwedagon Pagoda at at 98 metres (322 ft). The day after the Water Festival. နိုင်ငံအနှံ့ | Nationwide & around the World. Buddhist holiday when devotess pour water on Bo trees at famous pagodas, especially Shwedagon Pagoda. Ethnic festival in Shan State on the full moon night of ကဆုန် | ka1-hsone2 month. Shitthaung means 80,000. Buddhist celebrations at ancient Rakhine City on the full moon night of ကဆုန် | ka1-hsone2 month. Celebration of the first sermon of the Buddha. 中秋节 (Zhongqiu jie ) on the full moon day. Pagoda Festival and boat race at popular tourist destination. Exact date varies from place to place. All night long monks' robe weaving competition. Seventh largest ethnic minority reside in Kayin, Kayah, and Mon States. Here is What Myanmar Thingyan looks like. I made this video. 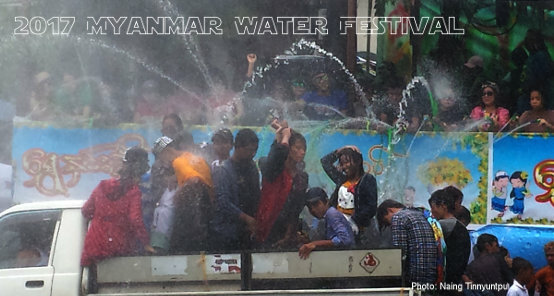 Water festivals thin3-kjan2 followed by Burmese New Year hnit-thit-ku3 around Mid-April are probably the most enjoyable and the most celebrated Myanmar holidays. There used to be as many as 10 straight holidays including Saturday and Sunday. Starting from 2018, it will be reduced to 5 days including weekends so that the fun will not disrupt official government business for a lengthy period. If you are in downtown Yangon, it is strongly advised against taking a flight during the water festivals, as the main roads to the Yangon International Airport from your hotel will be all clogged. Oh, yes, be prepared to get splashed by water if you go out in the street. How do you wish a "Happy New Year" to a Burmese? Good Question. I guess Burmese people don't waste time wishing because we know for sure we are going to be happy, and New Year day will surely come whether you wish or not. Radio DJ's might say min2-gla2 hnit thit ku3 ba2, but it is not a common collquial usage that Burmese people will say to each other. Give me once more in front of live audience. The ladies are dancing traditional Myanmar synchronized "Yain" Dance in tune with modern drum beats. This type of drum beat has become a norm in this time of the year. The first part of the song is oldie like from the 1930's. The ending part of re-mix is currently a popular Thingyan Water Festival Song which has become a classic. Seriously, there is no Burmese phrase equivalent to "Kong Hee Fat Choi" in Cantonese, "Gong Xi Fa Cai" in Mandarin, or "Happy New Year" in English. You can just say, "Happy thin3-kjan2 or tha1-kjan2, and any educated class will understand what you mean. You can expect song and dance and water splashing to continue for five days before the New Year Day. Myanmar shares Chinese New Year Day, Christmas day, and International Workers' Day with some other Nations as official holidays. In addition, Muslims celebrate Eid Day or it-nay1 to mark the end of a month long fasting known as Ramadan and another Eid Day at different time of the year for the feast of appetizing curry beef or barbecue mutton kabab using excellent spices. Those two days are known as Hari Raya Puasa and Hari Raya Haji in Malaysia and Singapore. Hindu folks have their own Deepavali Day or de2-pa2-wa1-li2 nay1 . At least in the old days, I had seen Hindu firewalking ceremonies around that time in Yangon. Yes, you must have guessed it right. nay1 refers to "day" in Burmese. Kasone Full Moon Day or ka1-hsone2 la1 pyay1 nay1 is known as Vesak Day in Malaysia and Singapore. It is the day of celebration for the Buddhists. This is the day the Buddha was born, reached enlightenment and pass away (to Nibbana). After reaching enlightenment, the Buddha did not immediately start teaching. It took him about 49 days to comtemplate and review his findings. Dhammacakka means the Wheel of Dhamma or the doctrine in the Pali language. The motion of this Wheel has started when he preached his first sermon to a group of five ascetics. The event is celebrated as da1-ma2 set-kja2 nay1 which falls on Waso Full Moon Day. Burmese people celebrate dtha1-din3-kjoot, also known as Abhidhamma Day and da1-zoun2-dine2 to mark the end of rainy season with fire crackers and lighting up of candles and lanterns. The lanterns decorated in this tradition are remarkably similar to those used in Chinese mid-autumn lantern festival. In Burmese tradition, Abhidhamma Day is supposed to be the day the Buddha taught Abhidhamma (higher learning) to beings in the heavenly world. Starting 2018, Thadingyut holidays are increased to three days, including on Thadingyut Eve and an extra holiday after the full moon day. Dazaungdaing is also increased to two days with an extra holiday on the eve. Those extra holdiays make up for holidays lost during mid-April water festival. Kathina Festival is known as ka1-htain2. It's somewhat like Buddhist version of Christmas with public display of presents on structures like Christmas trees, but the presents are for the monks. Lucky draws for the Buddhist monasteries are held anytime from after the dtha1-din3-kjoot full moon day to the full moon day of da1-zoun2-mone3 with money and daily necessities for the monks donated by the lay people. The actual date may be different from community to community even in the same town. Around the same period, some communities will have nate-bun2 zay3, which is similiar lucky draws for children of all ages. pweare3 means festival. pfa1-ya3 pweare3 are festivals held in pagodas at night, usually during cool months after the rainy season, which also happen to be "tourist" season in Myanmar. Temperature in highland regions around this time can drop below freezing point at night. As for other religious activities Myanmar, devout Buddhists observe u1-boat-nay1 individually, or as a group every week, while Christians attend the pfa1-ya3 kjoun3 (Church) every Sunday, and Muslims say their prayers in the ba1-li2 (Mosque) every Friday. u1-boat-nay1, is further explained in the left column of this page. For those doing research for your school project, etc., I might as well include other historic holidays. National Day known as a-myo3-tha3-nay1 falls on the 10th of Burmese calendar month da1-zoun2-mone3 after the Full Moon Day. That's the anniversary to mark the strike against the British rule by the University students back in 1920.
tut-ma1-dau2 nay1 (Armed Forces Day) which falls on March 27th was previously known by the name of tau2-hlan2-yay3 nay1 (Revolution Day). Back in 1945, near the end of World War II on that day, Burmese Army switched side and fought back the Japanese. pyi2-doun2-su1 nay1 known as Union Day in English (on February 12th) was the day Bogyoke (General) Aung San met with ethnic leaders (most importantly the Shan people) in the place called Pinlone where they agreed to join the Union of Burma as a trial run for 10 years after independence. Burma was still under British rule. Unfortunately, General Aung San (father of Nobel Laureate and NLD Leader Daw Aung San Suu Kyi) did not live to see loot-lut-yay3 nay1 Independence day on January 4th 1948, as he was assassinated a year earlier on July 19th. The anniversary of that day is known as ah2-za2-ni2 nay1, or Martyr's Day in English. Myanmar also observes some other events that are not public holidays. Myanmar Women's Day, for example, has been observed since 3 July 1996. The event is organized by the Myanmar National Committee for Women's Affairs (MNCWA), which was founded on 3 July 1996. This organization was renamed as Myanmar Women Affairs Federation on 20 December 2003. Annual awards are given to honor outstanding women with focus on excellence in business, literature, sports and education. Many Westerners have the tradition of making New Year's Resolutions. Having a good life with abundance of food, many wish to lose weight in the coming year. Do Myanmar people make New Year's Resolutions? It's like asking: "Do Myanmar people celebrate Mother's Day?" Yes, we do. Every day of the year is Mother's Day. Every day of the year is Father's Day. And every moment of the day is the opportunity for us as human beings to improve, to change, to celebrate life, to start afresh, to appreciate what the World has to offer to us here & now, to abandon what is evil, and to do what is good. With that note, I'd like to wish you a Happy New Year -- every day of the year! No, it's not in May and it's not a public holiday. But, with more people spreading the trend on the social media such as facebook, celebrating Myanmar Mother's Day has gained momentum in 2016 in honor of mothers on the full Moon day of the month of pya2-tho2. In 2016, it falls on Sunday, January 24th. If more people participate in this trend, it will be in the same month on the full moon day in Burmese Calendar from now on. OK, So, every day is Mother's day and we are happy every day, but that day is even MORE SPECIAL and we are 150% happier. Isn't that great? What's more? 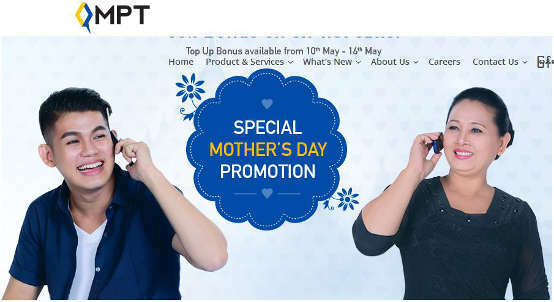 Some of us will again celebrate Mother's Day on the Second Sunday of May, as this too has become a trend promoted by the commercial business to increase sales.